Patrick Comerford: Does anybody care about the future of Portrane Castle? Does anybody care about the future of Portrane Castle? Last night, I was on a panel on Talking History on Newstalk 106, discussing the Reformation, and whether it failed in Ireland. The other panel members were Professor Ciaran Brady of Trinity College Dublin, Professor Alan Ford of the University of Nottingham and Professor Raymond Gillespie of the National University of Ireland. During the programme, a number of topics emerged – including the links between Church and State, the abolition of the monastic houses – that were to the fore in my mind earlier in the day when I visited Portrane and tried to take photographs of Portrane Castle. I was in Portrane, visiting my cousin Mary Lynders at The Quay House. On the way back, I stopped at the beach at The Burrow, and might have taken a longer walk on the beach but was tempted to take a look at Portrane Castle and its ivy-covered ruins. The castle is just a few hundred metres from both the shore at the Burrow and the ruins of Saint Catherine’s Church in Portrane, which is surrounded by an embattled wall. The link between church and castle was important in the past, for the Black Book of Christ Church shows that in 1040, King Sitric of Dublin, granted Portrane to Bishop Donatus of Dublin, the first Bishop of Dublin, along with the lands of Baldoyle. Strongbow confirmed the grant in 1170, as did Archbishop Laurence O’Toole in 1178. Portrane is listed among the possessions of Christ Church in Pope Urban III’s bull of 1186. However, Pope Clement III seems to have granted Portrane to the See of Dublin about 1190. When Archbishop John Comyn of Dublin asserted his claims to Portrane in 1197, the canons of Christ Church agreed to forego their claims to Portrane on condition they received 100 rabbits a year from the warren of Portrane. In 1204, Patrick, the sub-prior of Christ Church, relinquished all the rights of Christ Church in Portrane and on Lambay Island to Archbishop Comyn. Soon after, the archbishop granted the church in Portrane to the Prioress of Grace Dieu, an Augustinian convent at Ballyboghill founded in 1190 by Archbishop Comyn. In 1216, Pope Innocent III confirmed Portrane and the lands there to Archbishop Henry de Loundres and the See of Dublin. The first castle on this site was probably built in the 13th century as one of four castles stretching in a defensive line from Portrane, through Donabate and Lanistown to Belinstown. Once again, in 1337, King Edward III confirmed Portrane and the lands there to the See of Dublin, as did King Richard II when he was in Dublin in 1394. In 1403, the properties belonging to Archbishop Thomas Cranley of Dublin included the church, lands, rents, and services in Portrane. Archbishop Walter Fitzsimon increased the convent’s revenues in 1490 when he gave a house, a court, and a farm called Ballycaman to Margareta, Prioress of Grace Dieu. At the time, the parish church of Portrane was named as Saint Canice’s, and the lease also asked for a rose on Saint John’s Day each year. Until the Reformation, Portrane Castle continued to belong to the wealthy religious community of Grace Dieu, and their tenants at Portrane castle were the Cusack family. At the Reformation and the Dissolution of the Monasteries, Portrane Castle, the rectory and other properties in the area belonging to the Convent of Grace Dieu were handed over to Sir Patrick Barnewall of Turvey, ancestor of the Lords Kingsland, who is said to have built Turvey House from the bricks and stones of the ruined Grace Dieu, and to Sir John Barnewall, 3rd Baron of Trimlestown and Lord Chancellor of Ireland. The Cusacks continued to live at Portrane Castle, and in 1544, James Cusack was living at Portrane when he was made a judge. In the 1560s, it passed to William Fitzwilliam and then to Thomas Taylor. However, the former nuns of Grace Dieu also seem to have move to Portrane, and were living there with their own chaplain until at least 1577, when they were finally dispersed. By then the name of the parish church at the gates of the castle had been changed from Saint Canice’s to Saint Catherine’s. 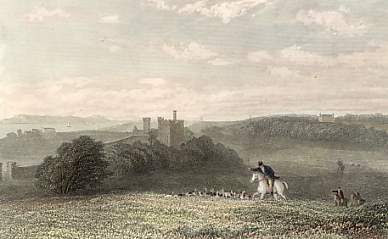 Portrane Castle and the rectory had passed to Sir Henry Harrington of Grangecon, a descendant of Francis Agar, who sold them in 1608 to Alderman Nicholas Ball of Dublin. By 1677, George Wallis was living in Portrane, and it appears Portrane Castle appears was rebuilt as we see it today at the beginning of the 18th century by Charles Wallis. Throughout all this time, the Archbishops of Dublin continued to be the nominal landlords, receiving a small ground-rent for Portrane Castle and estate, which were held on long and renewed leases. However, the Wallis family had difficulty in holding on to Portrane, and in 1709 they mortgaged Portrane and their other estates to Robert Sanderson of Co Cavan. By 1712, Honoria Swanton, the daughter of Willoughby Swift, a cousin of the writer Jonathan Swift, Dean of Saint Patrick’s Cathedral, was living at Portrane Castle. At the end of that year, Swift’s ill-fated “Stella,” Esther Johnston (1681-1728), spent several weeks with the Swantons at Portrane Castle, and ever since the castle has been known locally as Stella’s Castle or Stella’s Tower. Great mystery and controversy surround Swift’s relationship with Stella: were they secretly married in 1716? Did they have a child? If they were married, why did Swift never publicly acknowledge Stella as his wife? Ralph Wallis eventually redeemed the mortgage on Portrane Castle, but the family seems to have faced further financial problems. Another mortgage was raised on Portrane and eventually Ralph Wallis of Springmount, Co Laois, sold Portrane in 1728 to Eyre Evans, MP for Limerick, at the knock-down price of £395. The Evans family built a new house – known at different times as Mount Evans and Portrane House – on the Portrane estate. Samuel Lewis notes in 1837 that the last occupant of Portrane Castle was a Lady Acheson. Looking at the history of the Acheson family of Markethill, Co Armagh, it is difficult to figure out who this Lady Acheson might have been. There is a gravestone in Saint Patrick’s Churchyard in Donabate for a Catherine Acheson, who died in 1735, but she would never have been known as Lady Acheson. Despite its historic associations with Christ Church Cathedral, the Archbishops and Diocese of Dublin, the nuns of Grace Dieu and later with Jonathan Swift and his Stella, Portrane Castle seems to have been abandoned by the Evans family soon after they built their new house at Portrane. Portrane House survived into the 1950s, more than half a century after Portrane Hospital had been built on the estate. 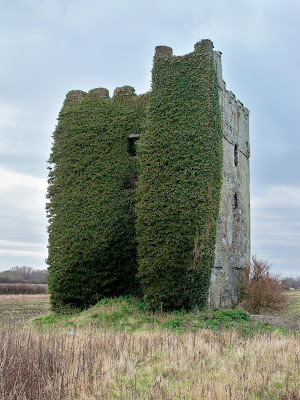 Now, Portrane Castle is dilapidated, and looks lonely and abandoned in a field in the middle of modern housing. It stands alone and forlorn in that field, decaying and in danger of soon being beyond repair or restoration. This lonely, ivy-covered, ruined square tower stands alone, without any trace of either a bawn or outworks. The castle is now in ruins, but within the four walls I could glimpse many steps can still be seen, and it appears that this was a four-storey building. 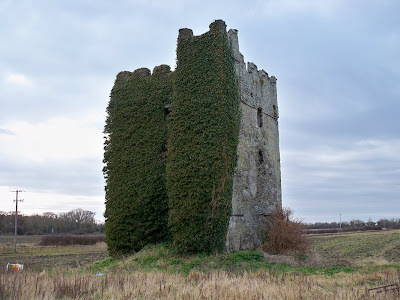 Two years ago, at a meeting of Fingal County Council on 24 April 2008, Councillor Gerry McGuire (Labour) of Donabate asked the County Manager to outline the long-term proposals for Stella’s Castle, and asked whether there are proposals to have a heritage centre located there. He was told that Stella’s Castle “is a very important heritage site” and that it originally had a more extensive complex of buildings than can be seen today. The castle is on council-owned land, and he was told “it must be treated as a National Monument.” It was said that under the Act, any proposal to carry out works must be approved by the Minister. Parks Works Programme funding was provided to secure the site with railings and carry out preliminary works for an entrance from the Burrow Road. However, the county manager said it would not be possible to consider restoration work on the castle until the restoration of Swords Castle, Bremore Castle and other heritage sites had been completed. Gerry McGuire, who lives in Donabate, has a good track record for raising questions about the castle. Back in 2004, he asked the County Manager to give a detailed report on the proposed New Village Scheme at Stella’s Castle, what the plans are and the time frame for beginning and completing this work. In addition, there was a promise that trees would be planted across the open space alongside the proposed line of a future access road to Stella’s Castle. He was promised that this work would be completed as part of the 2004/2005 winter works programme. On Sunday afternoon, however, it was impossible to find any tree-lined avenue leading up to Stella’s Castle, which looked forlorn and abandoned. I was forced to scramble up a mucky ditch to get into the area around the castle. The immediate surrounds were scattered with waste and rubbish and the embers of random fires. If Fingal County Council fails to act swiftly, then we will regret the way this link with Swift an Stella, with the nuns of Grace Dieu, this important part of the heritage of Portrane, has been abandoned.